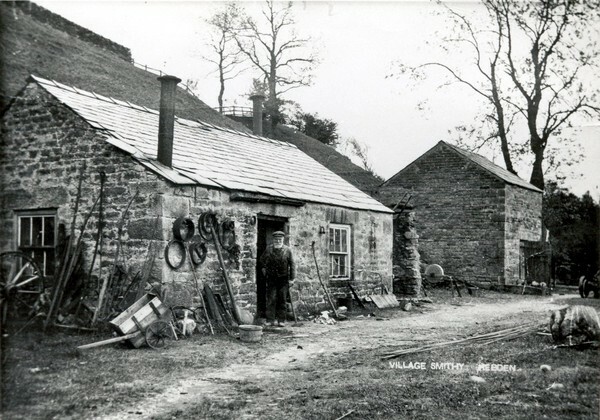 This postcard is of William Bell standing outside his smithy on Smithy Hill. Of particular interest are the mining railway lines lying on the grass in the foreground; the axles from a mining wagon bogey on the extreme right; the grinding wheel; and the chimneys which appear to be made from the same cast iron tubular structures as the supports on Hebden suspension bridge. The mine workshop is the building on the right, and is still standing. This photograph was probably taken in the late 1900s.